Makers: Cactus Saddlery. Rigging Type: Drop Dee. Saddle Maker Location: Greenville, Texas. Type of Saddle: Team Roper. Finished Seat Size: 14.5". Seat Type: Full Padded Suede. Skirt Length (Front to Back): 26". Circle Y western horse saddle. 15" saddle, aprox. Slightly used but in excellent condition Circle Y Roping saddle. Circle Y Leather Roping Ranch Saddle. Floral Oak Leaf Tooling. Very Heavy Solid Saddle. 16" Stitched Pattern Seat. They don't make them like this anymore. Silver Conchos. HAS OLDER STYLE BLEVIN BUCKLE STIRRUP ADJUSTERS. SADDLE WEIGHS 24.4 LBS. NEEDS TO BE REFLEECED OR USE THICK SADDLE PAD. SADDLE IS SOUND HORN IS TIGHT. STITCHING IS UNDONE IN 1 SPOT ON THE LEFT SIDE OF UPPER FENDER. Roping Saddle. This saddle is covered in floral tooling, and is finished with a padded seat. Finished Seat Size: 14.5". Tree Size: 15". Roping / All Around. Nice older saddle. 15" Circle Y.
Rigging Type: Drop Dee. Saddle Maker Location: Yoakum, Texas. Type of Saddle: Team Roper. Makers: High Horse by Circle Y. Finished Seat Size: 15". Seat Type: Full Quilted Suede. Skirt Length (Front to Back): 27". 17" Circle Y Ranch Roping Saddle. Made in Texas. Solid Wrapped Wood Tree. In Great Condition. Saddle Silo. Princeton TX 75407. Style# 2778. Circle Y Guthrie Select Roper Saddle. double stitched black suede seat. wide tree, fiberglass reinforced wood tree. mini snake border tool. silver laced rawhide cantle. stainless steel black antique conchos. 15.5" Circle Y Roping Saddle. Made in Texas. Solid Raw Hide Wrapped Wood Tree. In Good Condition. Saddle Silo. Princeton TX 75407.
circle y briscoe roper 14.5"
Maker: Circle Y Saddlery. Rigging Type: Drop Dee. Saddle Maker Location: Yoakum, Texas. Type of Saddle: Team Roper. Finished Seat Size: 14.5". Seat Type: Full Padded Suede. Skirt Length (Front to Back): 27". This thing is a Show-Stopper! 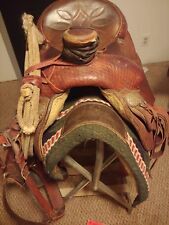 It is a 15" Roughout seat Heavy Tooled western Calf-Roping Show Saddle. Includes Headstall and Breastcollar by Bar H Equine and Oxbow. Can be used for a man or woman. Trending at $740.00eBay determines this price through a machine learned model of the product's sale prices within the last 90 days.